In the video below Donald Loose shows how he has attached some wheels to his moveable chicken coop so that it lies flat when the chickens are in it, but when he needs it to be moved to another place in the yard the lever can be pushed over to raise the coop up off the ground and it can be wheeled into a new position with minimal effort. That way his flock can enjoy their home being in a fresh area of his backyard which gives the soil they were on a chance to recover (and them a new cleaner patch to live on). To do so he used two handles made from scrap lumber, about 18 inches long and a couple of old lawnmower wheels attached with half inch bolts and nuts and washers. Lug bolts for the paddles to rest on and a block of wood to put a bit of space between the wheel and the coop on each side so that it can pivot freely. So basically the wheels get bolted to the paddles. Then, the paddles get bolts through the block of wood and the bottom base board of the chicken coop. A similar system could be used on a different coop design. There are many variations possible. Often it will be an a frame chicken tractor, some are built with a ramp up to a door cut out of a top level where the chickens can roost and lay their eggs, and then underneath they have a built in pen secured traditionally with chicken wire (although galvanised steel wire / hardware cloth is actually a stronger, more secure choice). 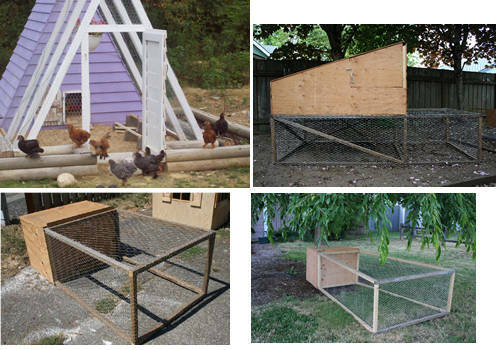 Our collection of chicken coop designs include several chicken tractors. We have an A frame chicken house (also known as a triangle chicken coop) as well as an under tree design, one with an upstairs roost and a retangular chicken tractor. Unless the building is being done with some really heavy solid wood they should all be movable by two people but it may make your chicken tractor easier to move if wheels are added.